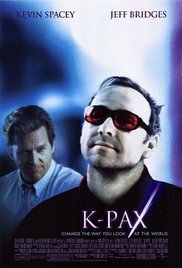 After claiming he is an extraterrestrial from the planet 'K-PAX', 1,000 light years away in the Lyra constellation, prot (uncapitalized and pronounced with a long O) is committed to the Psychiatric Institute of Manhattan. There, psychiatrist Dr. Mark Powell attempts to cure him of his apparent delusions. However, prot is unwavering in his ability to provide cogent answers to questions about himself, K-PAX, and its civilizations. His medical examination only reinforces his story, as prot can see ultraviolet light, which no human can, and he is completely resistant to the effects of the powerful tranquilizer thorazine. Dr. Powell introduces him to a group of astrophysicists who are befuddled when prot displays a level of knowledge about his claimed star system that was unknown to them. Read more on Wikipedia.